Ever found yourself on the bus to work needing to check what’s going on with your cloud infrastructure? How many times have you had to cut lunch short and run back to the office because you got an alert that something was wrong? 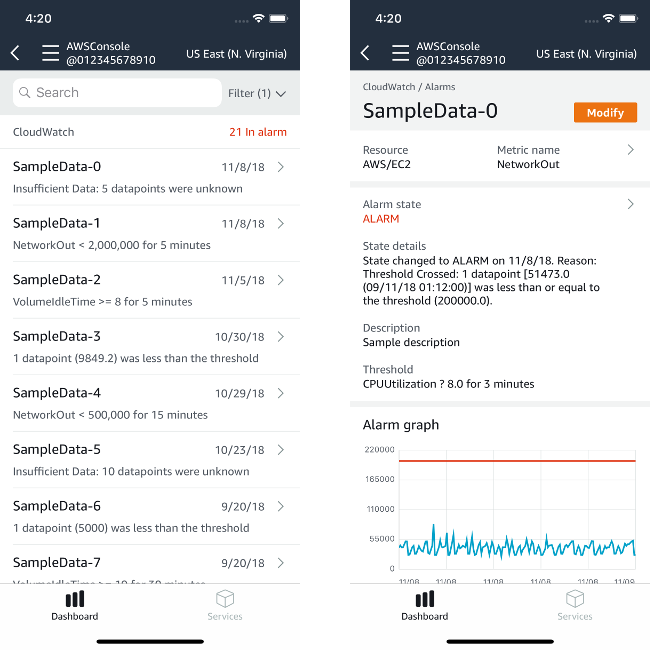 If you’re in the market for an effective mobile alerting and monitoring solution, we think you’ll be excited about the new AWS Console mobile app! This app complements the AWS Management Console experience by supporting your needs on the go. For example, it helps you with mission-critical tasks by making it easy to navigate data and do quick triaging of ongoing events and root cause analyses. Also, it lets you quickly and easily view and manage your existing EC2 instances, load balancers, Route 53 hosted zones, Amazon RDS instances, AWS Auto Scaling groups, AWS Elastic Beanstalk applications, Amazon DynamoDB tables, AWS OpsWorks stacks, CloudWatch alarms, and more from your phone or tablet. With the new app, you don’t have to deal with long passwords. It offers biometric authentication through Touch ID or Face ID technologies (on supported devices), which store user credentials. So after you set up your user and enable biometric authentication, you’re ready to go. After you’ve signed in to the app, you’re greeted by a new home screen. Like the rest of the app, it’s gone through a significant update to offer an excellent user experience. It’s set up as a dashboard—and only includes a summary of CloudWatch alarms, ongoing issues through AWS Health, and a Billing overview. This way, a user can get critical data in a single view. The dashboard also makes it simple to dive into detailed alerts. You can tap the area that’s presenting issues to follow trends, and view details and graphs. Need to modify a CloudWatch alarm threshold? You can do it from the app too. Another major change from the previous version of the app is that it now supports IAM roles. This means that users who leverage this type of IAM hierarchy in the AWS Management Console are no longer left out. For more information and to download the app for iOS or Android, see AWS Console Mobile App. We also plan to add new features to enhance the mobile experience. If you have ideas for features you’d like to see, please submit your feedback directly through the app.